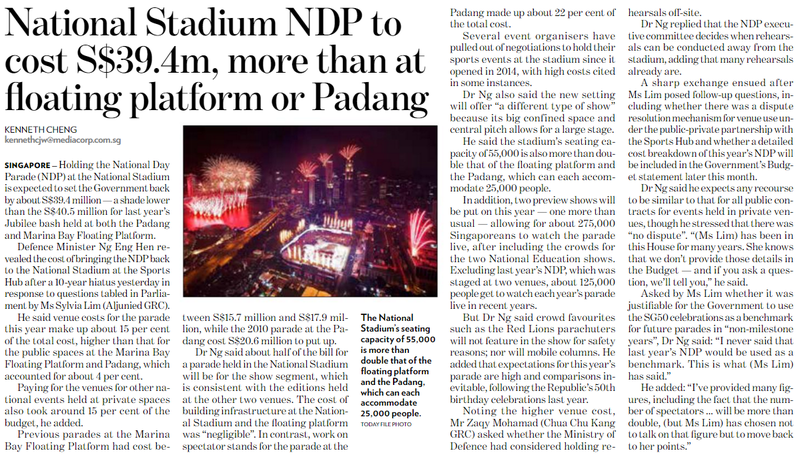 “Previous parades at the Marina Bay Floating Platform had cost between S$15.7 million and S$17.9 million, while the 2010 parade at the Padang cost S$20.6 million to put up” (National Stadium NDP To Cost S$39.4 Million, More Than At Floating Platform Or Padang, Kenneth Cheng). Publication of these figures will lend further weight to the argument that more Singaporeans will be able to watch the parade live, since per-attendee costs can be worked out. While Defence Minister Ng Eng Hen has revealed the S$39.4 million cost of holding the National Day Parade (NDP) at the National Stadium this year (TODAY, Mar. 1), with additional cost information of the past parades held at the Marina Bay Floating Platform and the Padang, perhaps more financial details of previous NDPs over the past 10 or 20 years – adjusted for inflation – could provide comparative context to the budgeted amount for 2016. It may not be possible to provide an extremely “detailed cost breakdown” of the upcoming NDP, but breaking expenses down into broad categories of venue costs, investments in the show or performance segments, infrastructure costs, or even the fireworks, for instance, could therefore be useful. Releasing the information will invite scrutiny, and maybe even scepticism over the amounts spent – though discourse over the costs and benefits of spectacles such as the NDP, considering implications for diplomacy or the supposed benefits of nationalism, could enrich the citizenry – yet an understanding of the (financial) planning involved could at the same time heighten appreciation of the executive committee’s work. Publication of these figures will lend further weight to the argument that more Singaporeans will be able to watch the parade live, since per-attendee costs can be worked out. Thereafter, questions can also be asked about now the committee has been able to manage its budget, given the higher venue fees, and if it has – besides conducting rehearsals away from the stadium to reduce sots – consider alternatives. If so, how much would parades at the Marina Bay Floating Platform or the Padang cost this year compared to past editions, and how are differences justified? In addition to higher levels of attendance, the NDP executive committee should make the case for holding the parade in a private venue, even if “paying for the venues for other national events held at private spaces also took around 15 per cent of the budget”. Amounts put in comparative perspective will, I believe, will be more enlightening. I remember reading in the ST in the late 1990s or early 2000s, a govt official mentioned in passing the cost of NDP for that particular year was about $12M dollars. I think ever since the big commercial bash approach in the late 1980s (when Canadian was paid to write songs like Stand Up For S’pore, We Are S’pore, etc etc) the budget was about $10M-$15M for each NDP. I have always disapproved of such NDP spending ever since I read that ST article. And now we have been & are going to spend $40M for NDP since 2015!! !